Traditionally Virgin Media is more of an urban centric cable operator, although a new campaign in the rural Test and Dun Valleys of Hampshire (England) means that their 350Mbps broadband and TV network will soon be able to reach c.4,000 premises across 12 small villages. On this occasion the unique opportunity that local residents have stems from the fact that Virgin Media already owns an old cable duct along the Test Way, which can in theory be used as a springboard to provide a “genuine all-fibre network” (FTTP/H). The villages that stand to benefit include Houghton, West Tytherley, Broughton, Wherwell, Winterslow, Firsdown, Michelmersh, Timsbury, Kings Somborne, Goodworth Clatford, Chilbolton and Stockbridge. Under the plan Virgin is said to have agreed to fund the bulk of construction costs, while applying a subsidised connection charge of £300 that must be paid by each property (a tiny fraction of the build cost). In return locals have been drumming up support for the installation and they recently blasted through the all important milestone of 1,000 sign-ups, which was required before the work could proceed (each village also needed to reach their own target of 25%). In addition to the community contribution above, there is also a £20 activation fee and an install fee of approximately £40 (typical charge but can go up to £99). However, residents will only pay these fees once the build is complete and they are able to receive the service. The roll-out is considered to be somewhat of a ‘Proof of Concept‘ for the operator, not least with respect to their close community engagement and the subsidy. However we should point out that Virgin Media does occasionally deploy into rural areas and we’ve reported on a few of those over the years, which most often occurs when their fibre optic cable passes under or nearby. As a result of all this Virgin Media are now able to proceed with their deployment, although it won’t reach 100% of the premises in each village but those who miss-out may still be tackled in a future extension phase (assuming one can be agreed). The build itself should then be completed by the end of 2018. “We are delighted to confirm that the Community Network Build Scheme has successfully hit its 25 per cent sign-up target set for the Test and Dun Valley area. 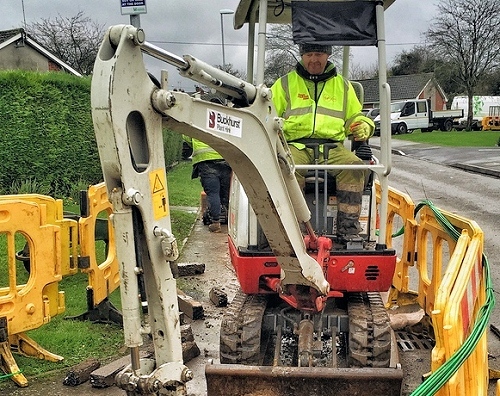 This means we will be connecting more homes to our fibre network to bring faster, more reliable Virgin Fibre broadband and unmissable Virgin TV. In order to facilitate the work a steering group has been formed, which consists of the build project manager, community liaison and public affairs from VM plus representatives from the local broadband campaign (TVNeed4Speed). They will meet regularly starting now until the end of the build. We did ask if more deployments like this one could be expected and Virgin responded to say that they were keeping their options open. Elsewhere we note that some of the aforementioned villages (e.g. 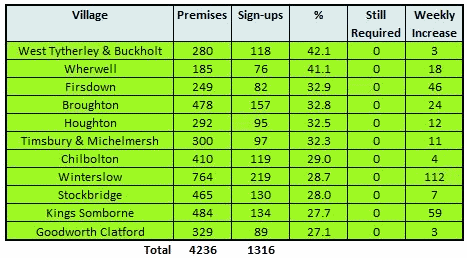 Chilbolton) are already being served by Openreach’s slower hybrid fibre FTTC (VDSL2) network, although a few of the residents have complained about the performance and reliability of related connections. At one point Gigaclear also considered rolling out their FTTP/H network into the area, although this was allegedly abandoned due to commercial viability concerns. Credits to one of the locals for highlighting this project to ISPreview.co.uk. Are the sign-ups contractual commitments like Gigaclear or more tentative? If Gigaclear style, then a good working model for VM to roll-out to “riskier” areas. What an excellent idea. Very well done to all those involved! Enjoy your slowdown at 3PM – after all why should FTTH customers get better service? Well done to them all, another project that demonstrates working with local communities works.